With a rapidly aging population and growing household debt, pensions have become a major public policy issue in Canada. We have three types of pension plans: the Canada/Québec Pension Plan, Registered Pension Plans (RPP) and Registered Retirement Savings Plans (RRSP). Only the CPP/QPP is public, however, every year billions more public dollars go to support the private plans than the public one. 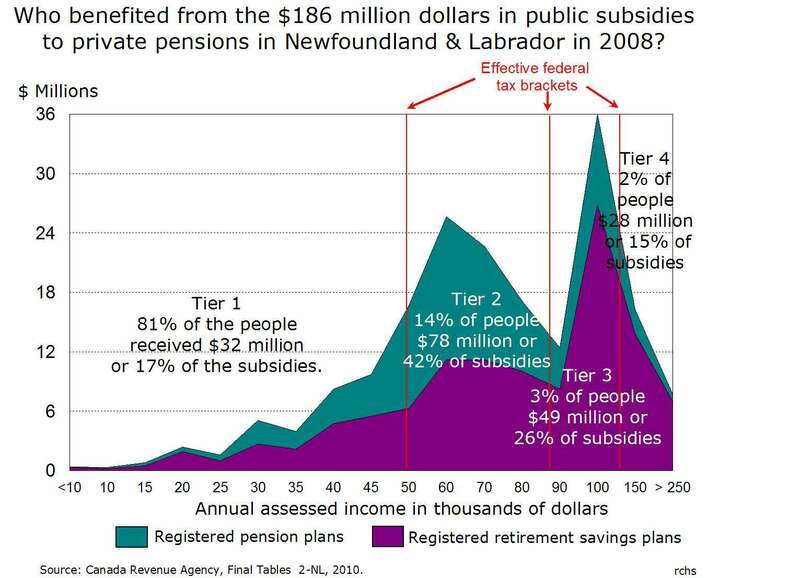 In Newfoundland in 2008, only 24% of the $249 million in tax breaks for pensions were in support of the public plan. To entice people to invest in private pensions we treat their investments differently than contributions to the public plan. In 2008, public subsidies to private pensions cost us $186 million. This gift is distributed overwhelmingly to the wealthiest among us, because greatly differing incomes result in highly skewed participation rates. If you are in the paid workforce and under the age of 65 in Canada, you contribute to the public pension plan, and so more than two-thirds of the people filing a tax return in 2008 in our province contributed to CPP. By contrast, less than a fifth of people filing a return contributed to a RPP, or to their own RRSP. Private pension contributions are concentrated in the middle income range, from $50,000 to $80,000 in assessed income. Most of these people are in unions. Contributions to RRSPs are typical only among high income earners, peaking at 71% for those earning more than a quarter of million dollars. The scale of this evident social inequity is further compounded by the favourable tax breaks we accord to private pension contributions. Both RPP and RRSP contributions are deducted from total assessed income prior to establishing your taxable income: as your income rises, so too does your tax break. 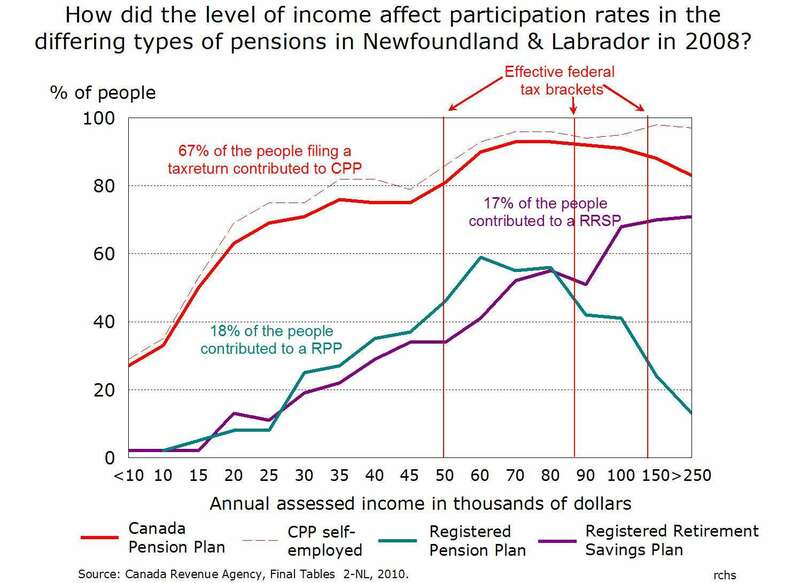 In Newfoundland & Labrador, a dollar saved in a private pension by anyone earning less than $40,000 a year, generates a tax break of 22.8¢, but those who are fortunate enough to earn more than $135,000 a year receive back 45¢ for every dollar they put into a RPP or their RRSP. In 2008, 850 members of the quarter-of-a-million-dollar-club chose to contribute to their RRSP, and we rewarded each one with a gift worth on average $6,966 from the public purse. Great to see the government here too favours the rich.